There's an old saying that goes "Do not discuss politics or religion in general company. "1 Within any conversation where the participants are passionate about their views, it is likely that emotions can get in the way. The talk gets heated and it degenerates to more seeking to wound the other person or simply trying to protect oneself. This next tip is so important, because it seeks to help you argue well. We will use a single topic to see how each dodge can play out, but this is just for example. Hopefully, you can recognize these and apply them to other discussions as well. Let's say we are discussing why God is necessary for objective moral values and duties. I've argued here that objective morality requires God to ground its precepts. Perhaps I tweet this article and get several responses. Let's walk through our scenario and see how to deal with each. Many times if you raise a point that the other person cannot or doesn't want to answer, they will throw out a smokescreen. 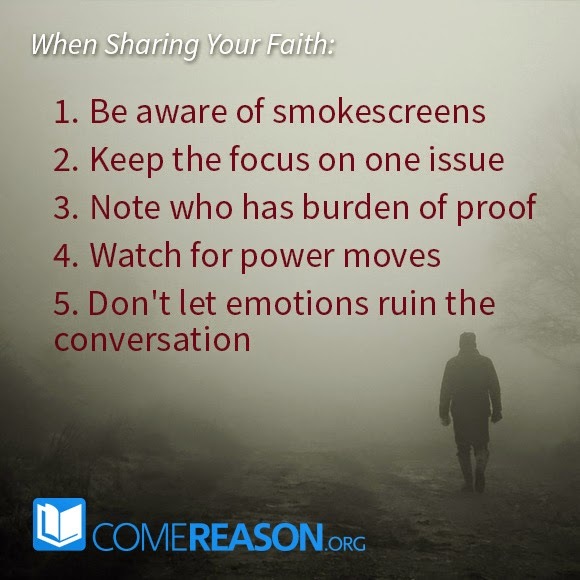 Smokescreens are questions or objections that are meant to a) take the pressure off them by bringing up some new subject or problem not related to the issue at hand or b) questions where the questioner isn't really interested in hearing the answer. So, for example, a person responded to my article by writing "Morals can't be grounded in an imaginary being... not grounded in Jesus any more than grounded in Santa." This response is clearly not dealing with the problem of morals being objective versus subjective. It's simply meant to inflame. If people are honestly seeking an answer, they will be open to discussion; otherwise it's not worth your time. Ask, "What evidence would you accept in order to change your views?" One time I was walking down a street and noticed a man on a bench who was shouting about the Iran war to the crowd. He spoke in brave tones and seemed very confident. But some of the things he said were very simplistic. I asked him how Just War theory fits in with his position. He actually got off the bench, took me aside and said in a normal voice, "Yes, I know about Just War Theory. I'm a professor as the local college." I asked, "Well, we should talk about it since it isn't quite what you're shouting." He replied, "Well, I have to use rhetoric in order to get the attention of people walking by." I found such as statement educational. The man was intentionally misrepresenting a position to draw attention to himself, but the people wouldn't know because he'd never shout the nuances of the debate. Don't get "shouted down" – assert yourself as having a right to be heard! Of all the tips I've presented, this one is probably the most important, since Christians are just as guilty of it as those they interact with. If your discussion with another person starts to turn where you can feel the blood rising in your face, it is probably time to take a break. As I said at the beginning, passionate beliefs can turn into more heated arguments. But this is exactly the wrong way to share your faith! Be firm in what you believe and don't let people abuse you, but you should never alienate the person because your emotions got the better of you. Take a break, ask to come back at a later time and finish the conversation. It's better to part ways and have the opportunity to be heard another time than it is to offend someone to the point where they will reject your message because they associate it with a vindictive messenger. 1. Hill, Thomas E. Hill's Manual of Social and Business Forms a Guide to Correct Writing. Chicago: Hill Standard Book, 1886. Print. 151. Available via Google Books here. 2. "Catching a Red Herring." Chicago Tribune. The Chicago Tribune, 02 Feb. 2011. Web. 17 Nov. 2014. http://articles.chicagotribune.com/2011-02-02/features/ct-tribu-words-work-herring-20110202_1_political-red-herring-red-herrings-origin.